I’m not sure they’re even trying anymore, director Michael Bay, the folks at Paramount Pictures, Hasbro or the cadre of producers and writers responsible for overseeing the Transformers franchise. They have an international cash cow. They know it. And that’s pretty much all anyone seems to care about. They’re not making these movies to entertain, they’re making them to sell tickets in countries where little things like plot, character development or honest human emotion don’t mean near as much as spectacular special effects and astonishing visuals. As for the rest of it, nobody wants to bother with it, because as long as the paycheck (and the payoff) is massive for all concerned, bringing to theatres a quality product is apparently the last thing on anyone’s mind. The latest effort, Transformers: The Last Knight, appears to fit all of those statements perfectly. Made by Bay on autopilot between attempting to stretch himself with films like Pain & Gain and 13 Hours: The Secret Soldiers of Benghazi, scripted with indifference by a bevy of writers including credited screenwriters Art Marcum (Iron Man), Matt Holloway (Punisher: War Zone) and Ken Nolan (Black Hawk Down), the sequel is all whiz and all bang augmented by nothing substantive whatsoever. While the visuals are as spectacular as any the series has so far delivered, this fifth chapter is so laughably inconsequential sitting there watching it is like being given the middle finger for a full 149 minutes while a maniacal madman cackles loudly somewhere off in a far corner. I’d almost go so far as to say this movie is mocking those choosing to see it, the level of disdain haphazardly tossed the audience’s way staggering. It’s still better than the rancid second film, Transformers: Revenge of the Fallen, but “better” is a relative term, and that doesn’t make me feel any happier about having watched this one. Also, as racist, sexist, misogynist and homophobic as that 2009 entry might have been, at least it didn’t feel like Bay and company had thrown in the towel. Here, they’re letting everyone do whatever they want. 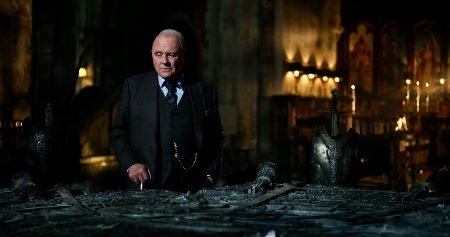 Anthony Hopkins swoops in to pick up an easy paycheck while going exuberantly nuts. Stanley Tucci pops up as a drunken Merlin (yes, that Merlin). Shia LaBeouf is made fun of for no particular reason. John Turturro gets to return as Agent Simmons and is annoying as ever. Mark Wahlberg hams it up with a hyperactive cheerfulness that makes one wonder if he was sniffing something during production. As for the plot, it has something to do with how the Transformers have been around for thousands of years, going all the way back to the time of King Arthur and his Knights of the Round Table. Merlin’s only remaining ancestor ends up being of vital importance in a way that is never explained and makes even less sense, while Transformers: Age of Extinction hero, Cade Yeager (Wahlberg), returns and discovers he’s been marked by ancient cybernetic warriors as a knight destined to save humanity from an unimaginable evil. 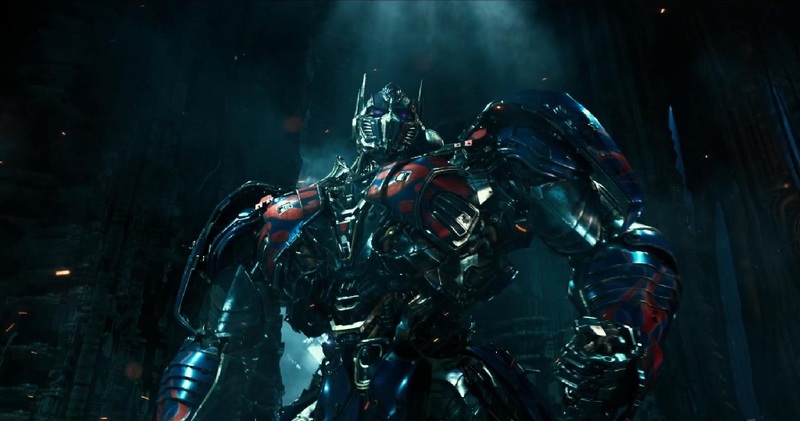 Optimus Prime (voiced by Peter Cullen) travels to the ruins of Cybertron only to be brainwashed by a being claiming to be his creator named Quintessa (Gemma Chan), this omnipotent seductress wanting him to return to Earth and facilitate its destruction. There’s more, including the arrival of Hopkins as an eccentric historian who must help Cade embrace his destiny as well as the reintroduction of Josh Duhamel’s character from the first three films, Colonel William Lennox, both of whom figure into the film’s hyperbolic climax by doing zero of consequence. We have a British historian, Vivian Wembley (Laura Haddock), who is the aforementioned ancestor of the wizard Merlin who also happens to be this film’s object of ogling that Bay can’t help himself from going out of his way to objectify. Topping it off, the film throws in a precocious orphan, Izabella (Isabela Moner), complete with tragic backstory, engineering brilliance and a cute little Transformer that she takes care of and repairs all her own. But it all equals nothing, because nothing feels like it is ever happening. As well staged as the carnage might be, as impressive as the visual effects undeniably are, it all still comes across as if it is being made up by a handful of preschoolers who were concocting stories during an abnormally long recess. 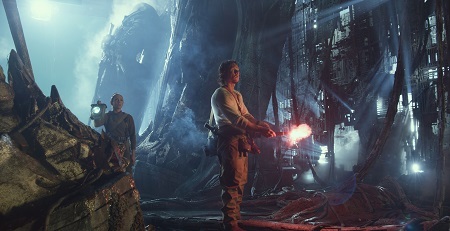 The film’s contempt for the audience is only exceeded by its bonkers, nonsensical narrative, and no matter how terrific the explosions might be or how dynamic the sound design is, it’s still impossible to get past the idea that this franchise has moved from attempting to please its legions of fans, to moderately tolerating them as things progressed, to now openly mocking them. There’s nothing more to say. 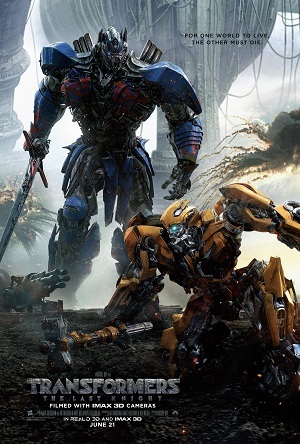 With additional Transformers films planned for the future and a spin-off focusing on the Bumblebee character scheduled to hit theatres next summer, Paramount and Hasbro appear to be driven to milk this robotic money making enterprise for as long as possible. But if there are any more entries like The Last Knight than the end for this series can’t come quick enough, and maybe it would be for the best if Optimus Prime and his Autobots gave up on the human race and left us to destroy ourselves in relative peace and quiet.